This week is Thai week here a Measure & Stir, and so we continue our vinous voyage of drinks inspired by the flavors of ประเทศไทย with another soju infusion. Of course soju isn’t Thai at all, but the motivation behind Thai week is that Joe was asked to come up with some drinks inspired by Thailand using a limited palette of wine, beer, or soju. 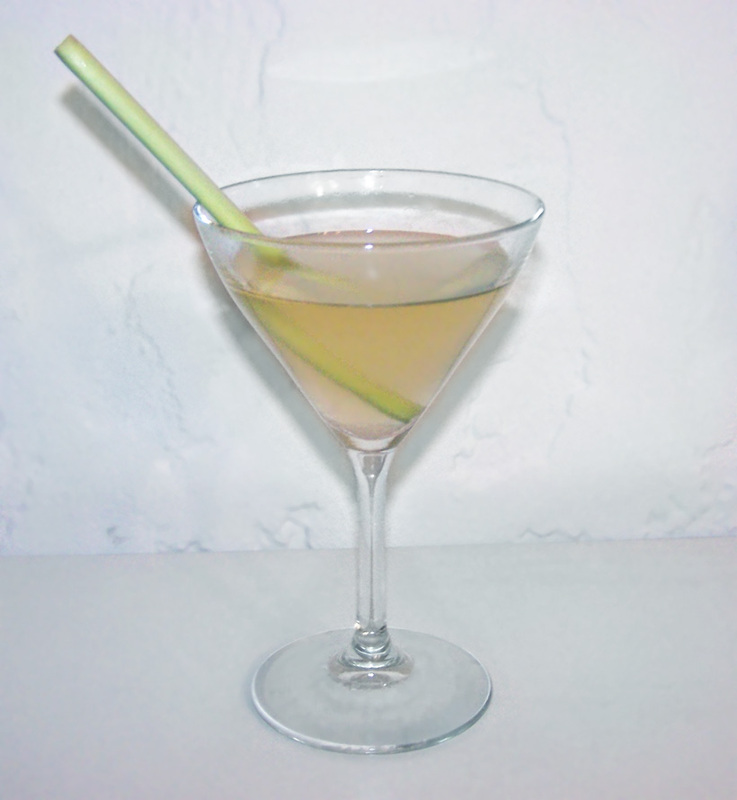 Slice lemongrass into small chunks and muddle it into the dry vermouth. Pour everything into a mixing glass with ice and stir well. Strain into a chilled cocktail glass and garnish with a sprig of lemongrass. Things we learned while making this drink: We didn’t infuse lemongrass into the soju with the juniper berries and only muddled it with the dry vermouth. The problem is that the lemongrass doesn’t really come through completely unless it is also infused into the soju. Only using one of these methods to incorporate the lemongrass results in an incomplete, weak representation of lemongrass flavor. We should have remembered our last experience of mixing with lemongrass, when we used turmeric juice and lemongrass together, which also produced a less pronounced lemongrass flavor. Let our mistake be a lesson for you. Second, we used Fee’s lemon bitters. Fees bitters are awful, but we simply didn’t have anything else on-hand at the time. Instead, we’d have loved to have used The Bitter Truth’s Lemon Bitters. The drink itself is surprisingly refreshing, reminiscent of a real martini, only not quite as stiff. The juniper berry/lemongrass infusion did a better job at simulating gin than I had personally thought it would. Lemongrass adds a fresh, zesty, lemony flavor and the dry vermouth does a lovely job of bringing it all together into a cohesive experience. Categories: infusions, modern drinks, original creations | Tags: alcohol, bartending, booze, cocktail, cocktail glass, cocktails, drinking, drinks, dry vermouth, green, infusion, lemongrass, mixed drinks, mixology, soju, thai, thai food | Permalink.